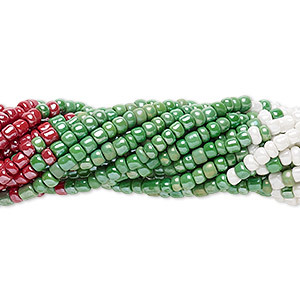 Seed bead, glass, silver-lined transparent green / red / clear, #11 round. Sold per pkg of (10) 15-1/2" to 16" strands. Item Number: H20-A1059GL Have a question about this item? 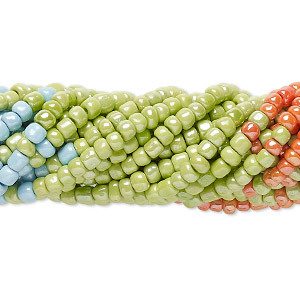 Handmade size 11 glass seed beads are matched and strung into high-contrast color combinations. Popular colors combined with silver-lined glass, plus luster finishes, make this an alluring selection. 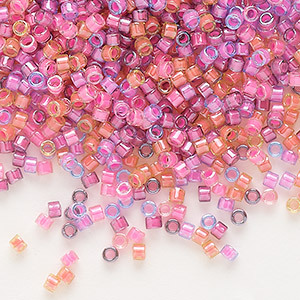 Package includes approximately 2,500 beads. Handmade in India. Colors, shapes and sizes may vary. 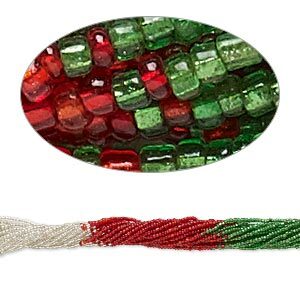 Seed bead, glass, silver-lined transparent green / red / clear, #6 round. Sold per pkg of (10) 15-1/2" to 16" strands, approximately 1,300 beads. Seed bead, glass, opaque luster turquoise blue / light green / peach, #11 round. Sold per pkg of (10) 15-1/2" to 16" strands. 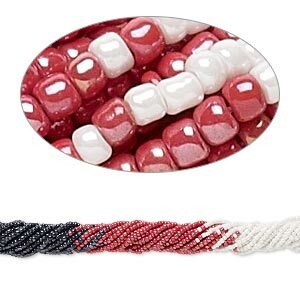 Seed bead, glass, opaque luster black / red / white, #11 round. Sold per pkg of (10) 15-1/2" to 16" strands. Seed bead, glass, silver-lined transparent dark purple / teal blue / lavender, #6 round. Sold per pkg of (10) 15-1/2" to 16" strands, approximately 1,300 beads. 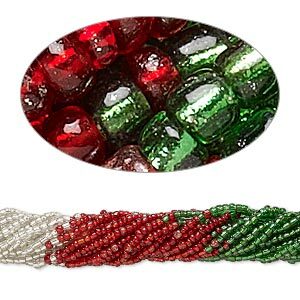 Seed bead, glass, opaque luster red / green / white, #6 round. Sold per pkg of (10) 15-1/2" to 16" strands, approximately 1,300 beads. 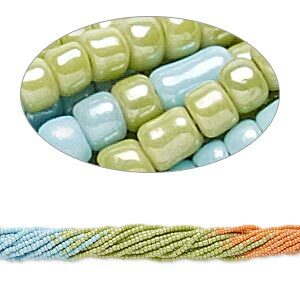 Seed bead, glass, opaque luster turquoise blue / light green / peach, #6 round. Sold per pkg of (10) 15-1/2" to 16" strands, approximately 1,300 beads. 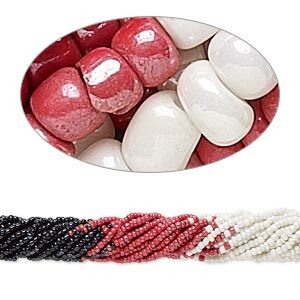 Seed bead, glass, opaque luster black / red / white, #6 round. 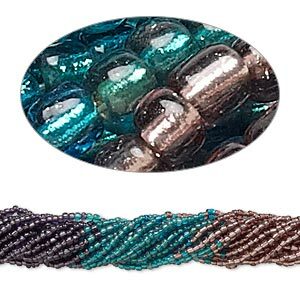 Sold per pkg of (10) 15-1/2" to 16" strands, approximately 1,300 beads. 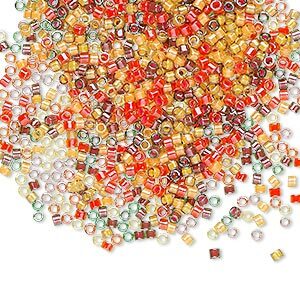 Seed bead mix, Delica®, glass, transparent color-lined luminous desire, (DB2064), #11 round. Sold per 250-gram pkg. 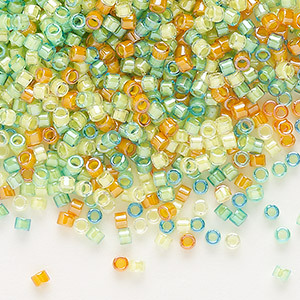 Seed bead mix, Delica®, glass, transparent color-lined luminous neon, (DB2066), #11 round. Sold per 250-gram pkg.